If you want to change any data associated to the business account created on Moneymailme (examples: name of the company due to some mergers, company website, company address, legal representative email address, etc. ), go to account.moneymailme.com web page. After login, go to Notifications menu on the left side of your screen. Choose Notification type as Legal user update, then describe the data you wish to change. After this, click on Send to send a notification to the Moneymailme team. Note: in case of Moneymailme business account changes, if data in previously submitted documents changed, new documents must be submitted for approval. See Documents section for more details. 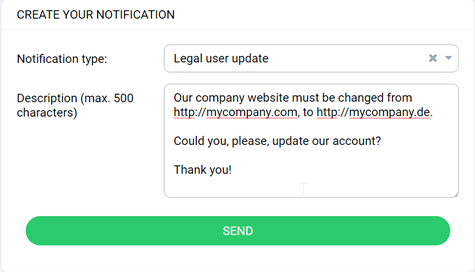 If the Moneymailme team approves the data changes request, your account will be updated accordingly and you will receive a confirmation email when this happens. However, if the Moneymailme team finds the changes as inapropriate, your request will be rejected and you will receive an email accordingly.